I bought this dress today and I'm in love. Pricey at £48 but totally worth it. I dont know why spending £50 odd on a dress in Topshop seems quite reasonable to me, where as if I spend £50 on a dress in New Look or another highstreet shop I'd be gasping in horror! Alas I did spend it, I dont regret it as its perfect on & the colour will look amazing in the summer. I put the three stone natural ring mix on preorder, as I've had so many email requests to put them on preorder, you can use the 20% code (20OFF) when ordering them & they probably will be shipped towards to beginning of next week! ohhhh! beautiful! I want it! I really want this, this is so pretty! Whenever I make a pricey Topshop purchase I always try to justify it by its good quality! This is a definite must have and will be suitable to wear all year. Enjoy your day in London! Oh this is so pretty :) I love it in orange too! oooh but it is lovely!! slightly pricey but lovely colour. I am sure it will look fab on. Enjoy! Aw I bought this in cream for my birthday (: LOVED it! ohh, i've been admiring this dress for quite some time. can't wait to see you in it, sure you will look amazing! It's cute, I think if you absolutely love something in design & quality... then you should buy it, you'll love it forever so you can easily justify spending the money so why not! I love that dress when I saw it on the website! The colour is gorgeous. Ohhh this dress is on my 'to order' list as I'm after a dress for a wedding at the moment and want one I will wear again. I reeeeeally want the cream version too! Such a lovely shade of blue! Can't wait to see you dolled up in it! This dress is amazing, i love the colour ! It's too pretty! I think it'll look great against tanned skin in summer, and it'll also complement your hair colour. Lovely choice! it's such a cute dress. lace sleeves are the best. Oh what a gorgeous dress, love the leafy lace and oh my what a colour! Love a bit of royal blue. It'll look great with your brown hair. Worth every penny. Cant wait to see this beaut in an outfit post. Oooh it's absolutely lovely, worth every penny! I have this dress in white :] its lovely, despite it being uber short on me, its definetly worth the price! 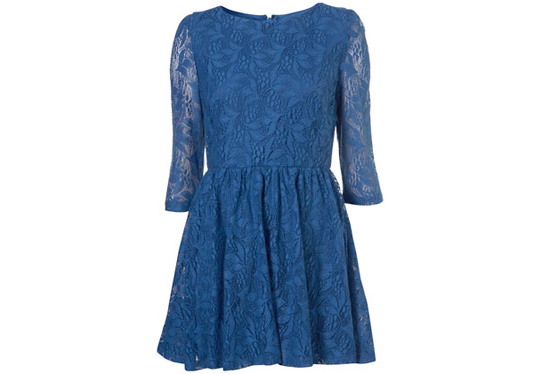 Everyone needs a little blue dress, a pretty lace one in fact. Lace is lovely. i think its worth the money, blue, lace well fitted - what more do you want?! this dress is to die for, the colour is gorgeous! it's sometimes nice to spend that little bit extra on something worth it - and i'm completely the same when it comes to feeling that £50 is acceptable in topshop, but not in other highstreet stores, it's crazy! excited to hear your london antics! Aha, new layout! And of course, the lace detailing is gorgeous, Lily. This dress is nice, I have it in the cream. Mine has gone a bit bobbly on the side where i've been carrying a satchel bag and the buckles been catching on the lace. So be careful of that. I wanted a lace dress and i think this is the perfect one. Tempted to buy it in blue AND the orange. If only if it was cheaper. they have one similar, and more expensive, at FCUK...such a cute dress! Wow why don´t i own this?! Wonderful...I like it!!! I love the blue color,and this dress is fantastic!!! So so beautiful! I love the floral patterns in the lace! Giveaway at London Last Night!